Surrey Storm player-coach Tamsin Greenway says are in good shape ahead of the Superleague grand final. The Storm face Hertfordshire Mavericks at the Copper Box Arena on Saturday. "The way we have built throughout the whole season, it was always putting us in good stead for this final," the 32-year-old told BBC Surrey. "We've got a really strong squad, which has shown in our performances this year. I have every faith they can go and do the job." Greenway's side finished second in the table this season and overcame Yorkshire Jets at the semi-final stage, winning 76-60 to book their fourth final appearance in five years. "The semi was a close encounter," the wing attack added. "We were down two at half-time and came back and absolutely smashed them in the third quarter. We have been putting in stronger and stronger performances." Storm have lost their three previous grand final appearances and Greenway is determined that this time her side do themselves justice. "No-one deserves to win a final," the England international said. "Do I think we should win it? Yes, I would say the squad is good enough if they perform well. "We will be really difficult to beat, but it is about whoever steps out on the day and puts in the winning performance." 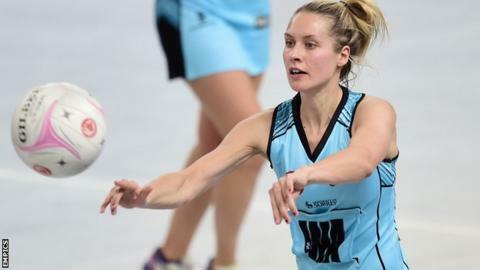 Hertfordshire Mavericks finished fourth in the table, losing six of their 14 regular season fixtures, but beat reigning champions Manchester Thunder to make the final. "I said at the start of the season that Mavericks were the team to beat. They have the strongest squad across the board," said Greenway. "Realistically, and I think they'll be honest, they hadn't put on a performance until the semi-final. They hadn't beaten any of the other top-three teams. "For them it is a surprise in how they have been playing. But they are a brilliant team with so much potential and that is why I didn't want them in the semi-finals." Storm beat the Mavericks 55-42 in front of 6,000 spectators at the Copper Box earlier this season and Greenway says coping with the big-game atmosphere will be crucial if they are to triumph on Saturday. "You've got so many emotions; some players who have never been in a final before, some who have been and have the memory of losing and you have all kinds of stuff going on. "How the team copes with it on the day is the challenge of being a player-coach - to get them in the right mind."